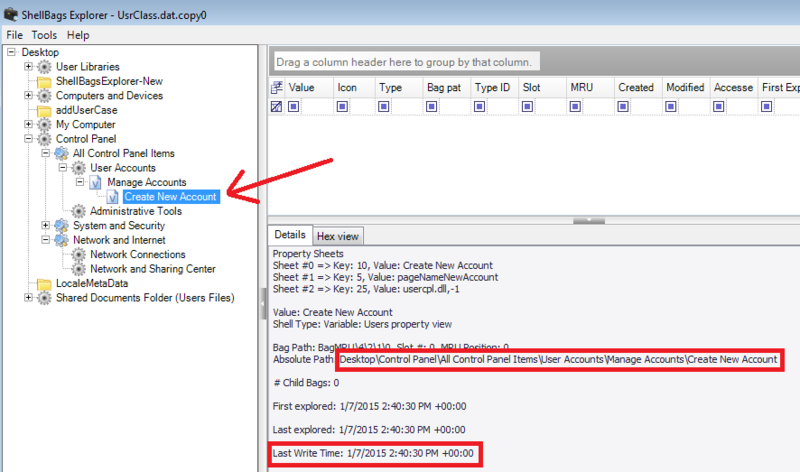 In the Event Viewer, the creation process logged (among a couple others) the event ID 4720 “A user account was created”. For the sake of creating some deceptive I won’t mention which user was created first CLI or GUI; the first user was created at time 1/7/2014 4:40:02 pm where the second was created at 1/7/2015 4:40:30 pm. At this time @azeemnow had already prepared a super timeline (could be found here: URL). The timeline showed no proof to our investigation! After a discussion with Harlan @keydet89 on mail, he pointed me to check for the net.exe and net1.exe prefetch files, last executed times, and that they will be shortly before the user account was created. This check is to prove that a user account was added using the CMD.EXE. I extracted both files and used Jean-Michel Picod’s @jmichel_p prefetch Python script to examine this (my prefetchParser.py has some issues so its not complete). Correlating the results from the prefetch files and the events found, we can assume that the user that was created at 2015-01-07 14:40:02 is the user account created from the CLI “CMD.EXE”. Now what about the other user? The clue Harlan gave me was to check shellbag entries for the user account used to create the user pointing to the User Account applet. Okay I said to myself; this is the best time to check Eric Zimmerman’s @EricRZimmerman latest ShellBags Explorer and give it a try (download it from here: ShellBagsExplorer). I extracted the UsrClass.dat for the user who created the accounts and loaded it into Eric’s Shellbags Explorer; and it truly does a fantastic job of categorizing things and displaying all the activity recorded in a simple tree heirarchy way. From the SBE I found that the user has opened the Control Panel, User Accounts at time 1/7/2015 2:40:20 pm. By clicking on the User Accounts applet, the Manage Accounts page was displayed to the user also at time 1/7/2015 2:40:22 pm. Then from there the user has opened the Create New Account window, which he/she used to create the account at time 1/7/2015 2:40:30 pm. 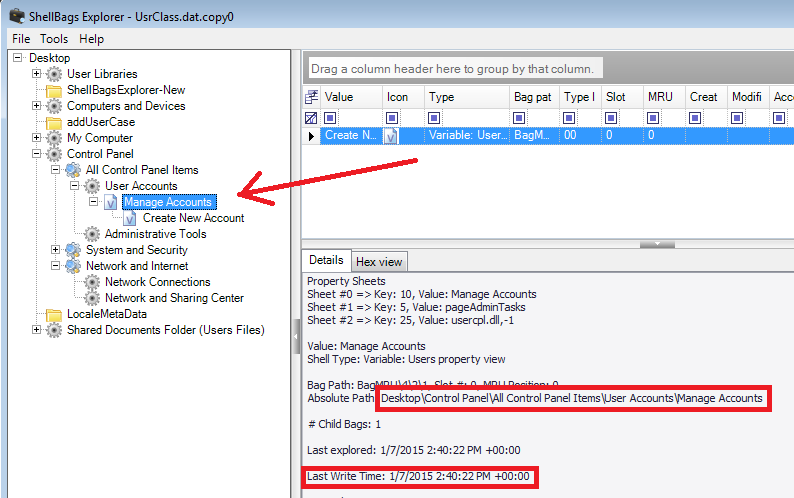 If we correlate the creation time found from the ShellBags Explorer with those in the Events Viewer, we can confirm that the second user that was created at time 1/7/2015 4:40:30 pm is the user account that was created from the GUI “User Account” applet and not from the command line. – Testing was done on a Windows 7 32 bit. Maybe later will check on another system especially Windows 8. – I’m no forensic expert, so correct me wherever you find a mistake in this post. 1- Thanks to Azeem for shouting the question, which gave the idea for running a test. 2- Thanks a lot for Harlan, not just for helping me here, but for his consistent DFIR community support and priceless posts! 3- Thanks to Eric Zimmerman’s Shellbags Explorer. I highly recommend you download the tool and read the wonderful documentation that comes with it. This entry was posted in Forensics, Windows and tagged Analysis, Forensics, Prefetch, Shellbags, User, Windows by [email protected]. Bookmark the permalink.